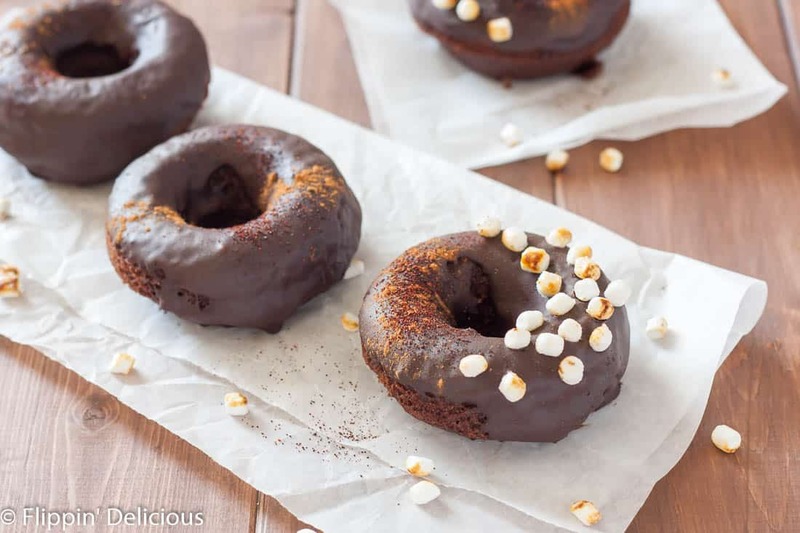 Dairy Free Gluten Free Mexican Hot Chocolate Donuts are rich and sweet with a hint of heat! Vegan option. 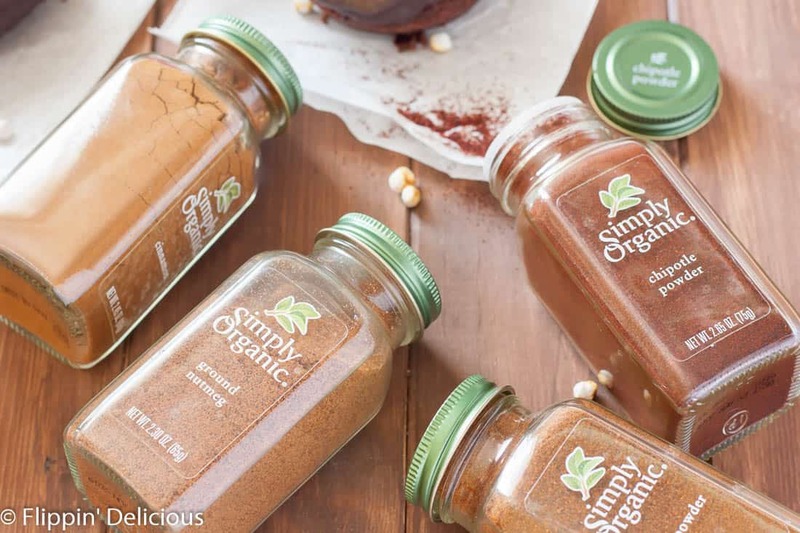 This recipe won the Grand Prize in Go Dairy Free’s Simply Organic Bake-Off! By recipe testing, not just popular vote. New Mexico is the place that I call home. It is who I am and I am often inspired by the local classic recipes and flavors. 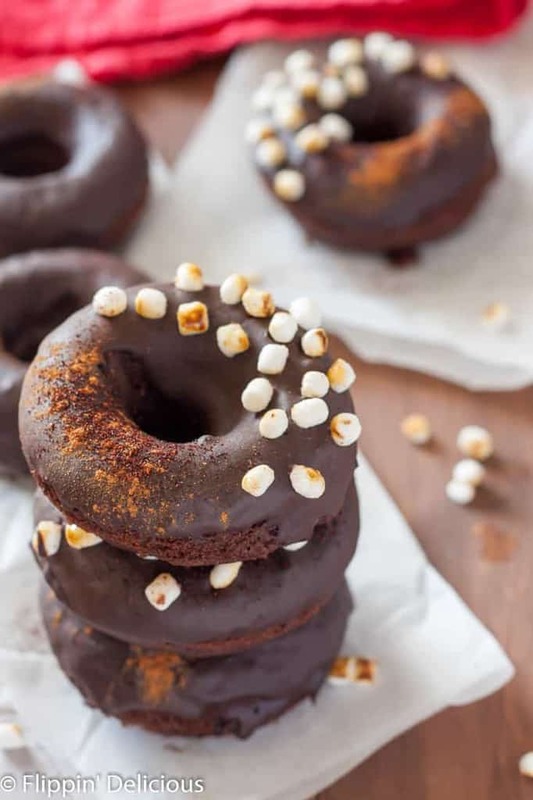 These Mexican hot chocolate baked donuts are so easy to make! The sweet chocolate and the heat from chipotle powder is an epic combo that will keep you going back for seconds. Mexican hot chocolate is rich and sweet, with cinnamon, vanilla, and of course some chile! I combined all of these dynamic flavors into a gluten free dairy free baked Mexican hot chocolate donut dipped in a sweet and spicy chocolate glaze. Of course I had to top them with some toasted mini marshmallows! Together, all the flavors will make your taste buds tingle! For millions of people, the fall is a special time for enjoying food with loved ones. To help everyone share in the moments, Simply Organic and Go Dairy Free have teamed up with 10 talented food bloggers (including me!) for a Bake-off! Each blogger will create sweet and savory recipes that are filled with flavor, but fit for dairy-free and other special diet needs. When I was invited to participate I knew I had to go back to my those sweet and spicy flavors that so often inspire me and created these dairy free gluten free Mexican hot chocolate donuts! 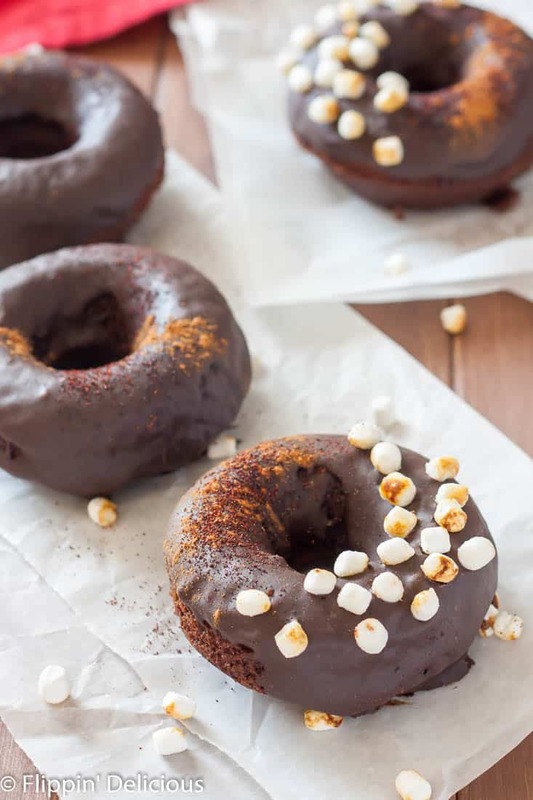 I used Simply Organic Nutmeg, Cinnamon, and Chipotle Powder along with my favorite vanilla extract and dutch processed cocoa powder to give gluten free dairy free baked donuts all the flavors of Mexican Hot Chocolate. When my husband and I were engaged we both sang in a church choir. After our final holiday performance was over our choir director invited all of us to her home where she serve us Mexican hot chocolate with crusty bread and cheese. It sounds weird but don’t knock it ’til you try it! The bread and cheese helped to balance out the spiciness of the hot chocolate. As I bit through the sweet chocolate glazed on one of these donuts, feeling it crackle beneath my teeth, I was whisked away to that holiday season when I first had Mexican hot chocolate. My first introduction to the spicy/sweet combo that I am now crazy about. Moments after taking that first bite I could feel the heat of the chipotle at the back of my tongue and the memories of sitting next to my fiancee at our choir directors kitchen table came rushing in. Just sitting, holding hands, and dipping bread into spicy hot chocolate. I am excited to create some more memories with my family this year , enjoying these dairy free Mexican hot chocolate donuts. 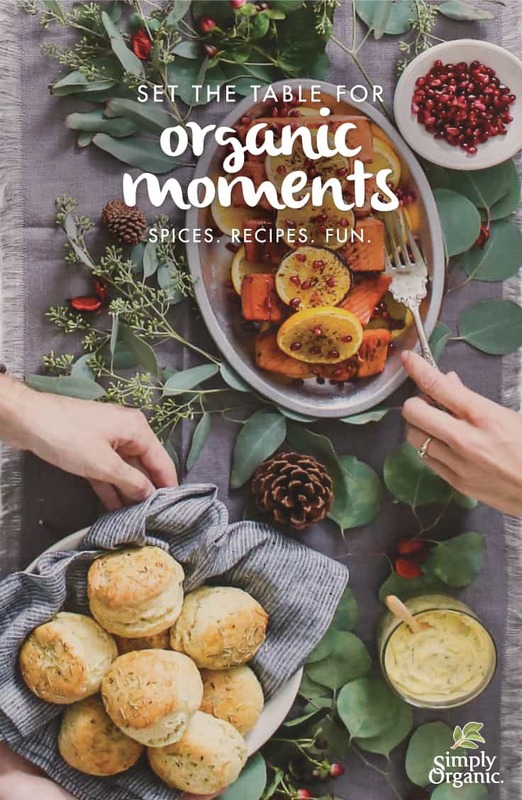 To enjoy more recipes from Simply Organic, follow the hashtag #OrganicMoments. To follow this event, vote, enter to win prizes, and find more exclusively dairy-free recipes, visit https://www.godairyfree.org/news/simply-organic-bake-off. Preheat oven to 425F and lightly grease a donut pan. In a measuring cup, combine the dairy free milk and vinegar and let sit for at least 5 minutes to create dairy-free "buttermilk." In a mixing bowl whisk together the gluten free flour, cocoa powder, xanthan gum, sugar, baking powder, salt, and spices. Create a "well" in the dry ingredients and add the egg, oil, vanilla and dairy free "buttermilk" and whisk to combine. Scoop the batter into a sandwich bag, snip a corner off, and pipe the batter into the donut pan filling each donut about 2/3 full. Bake for 7-9 minutes or until a toothpick comes out mostly clean. In a microwave safe bowl whisk together the powdered sugar, cinnamon, and chipotle powder. Add the dairy free milk and vanilla and whisk until smooth. It will be very thick! If you don't like as much heat go ahead and use chili powder instead of chipotle powder. You will still get some of the depth of flavor, but in a more kid-friendly version. My kids wouldn't eat the donuts because they thought they were too spicy. It didn't stop my toddler from picking all of the marshmallows off the top and eating them, though. 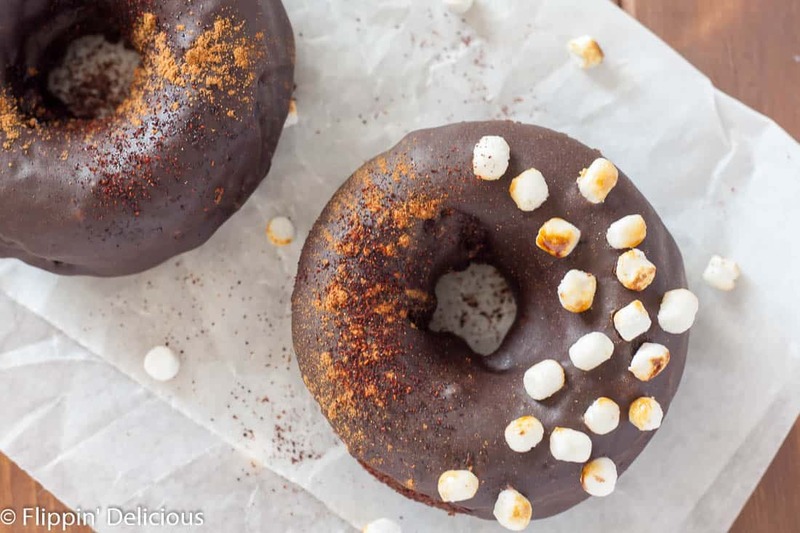 You can easily make these donuts vegan by using your favorite egg substitute and using vegan marshmallows when decorating. I love, love, love this idea! do you think it would be good without the cinnamon? Hi Sarah! I think it would still be great without the cinnamon. 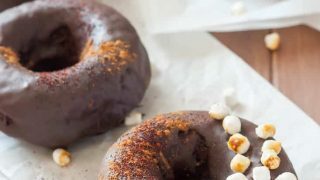 Cinnamon is essential to the Mexican hot chocolate flavor, but you would have chocolate chile donuts which is still pretty amazing! We have a cinnamon allergy in the family, believe it or not! Wow, these are amazing Brianna! I love the mini marshmallows on top – so cute! Thanks Alisa! The marshmallows were the first to go as soon as I put the camera away. My toddler picked them all off! All you had to say was CHOCOLATE + DONUTS. These look SO amazing, Brianna! I can’t wait to dive into this recipe!!!! Love the Mex-choc combo, too. And I’m not even from New Mexico! seriously drooling over these!! spicy chocolate donuts. I’m in! Hi Sunny! Xanthan gum will much improved the consistency of the finished donut. It simulates some of the structure that the gluten in regular wheat flour normally would contribute. You can try making it without xanthan gum, however I have not tested it without. I assume that the donuts will still turn out, they will just be more delicate and crumbly. Happy Baking!